Bone mineral density, bone mass and the resulting stability of the bones change over the course of our lives. Our bones are not rigid, they live and change. This process of bone remodelling is not just age-dependent: it is also directly linked to the physical demands made on our bones by the loads they have to withstand. Humans continuously develop bone mass until they reach around 30 years of age. Between the ages of 30 and 40, the skeleton has its maximum bone mass and current medical thinking believes their highest density too at this age. After the age of about 40, our bones start to deteriorate very slowly – a normal and natural process. This degeneration usually only becomes significant and problematic from about the age of 55, when bones start to break. However, in some cases – due to a lack of physical exercise, cancer treatment, having anorexia or an early menopause – bone degeneration occurs at a younger age. The mass and substance of our bones change over the course of our lives. Everyone has a unique bone structure which develops individually. However, all our bones have one thing in common: they respond positively to being stimulated by loading – even in old age and especially in the case of osteoporosis. A disproportionate loss of bone density is common among women after the menopause with hormonal changes making them prone to osteoporosis. However, men can also be affected and should be aware of this. The nature and extent of bone loss are determined by genetic predisposition, impact of illness or disability, physical activity levels and diet choices as well as hormone change. Anyone at risk of low bone mineral density or concerned about it, can have a measurement taken quickly and painlessly. Osteoporosis is normally diagnosed by a measurement of bone mineral density (usually referred to as BMD) that establishes the strength and stability of the bone and its mineral density (primarily calcium). The BMD test is often called the DEXA test as it uses Dual Energy X-Ray Absorptiometry measurements to establish the condition of bones. The result is given as a value: the difference in an individual’s value compared to a healthy 30-year old person of the same gender is known as their T-value or T-score and doctors use this to evaluate how good or poor the bones are relatively. The bone mineral density measurement is given as a T-score. A T-score of between -1.0 and-2.5 indicates a pre-osteoporosis stage know as osteopenia which means there is slight bone loss usually without physically perceptible symptoms. Osteoporosis is diagnosed in anyone with a T-score of less than -2.5 which indicates more severe bone loss, which can lead to fractures. A T-score is not fixed: it can change over the course of time and treatment by increasing or decreasing and then being measured again. Medical experts can see the progress being made by an individual. A stable and sufficient bone quality is normally ensured by taking physical exercise to load the muscles and bones and by having an active core muscle system (type IIA muscle fibres). Bones adapt in response to the exercise being taken. This process is called bone remodelling and it requires a balance between the build-up and break down of the bone substance taking into account the demands on it. 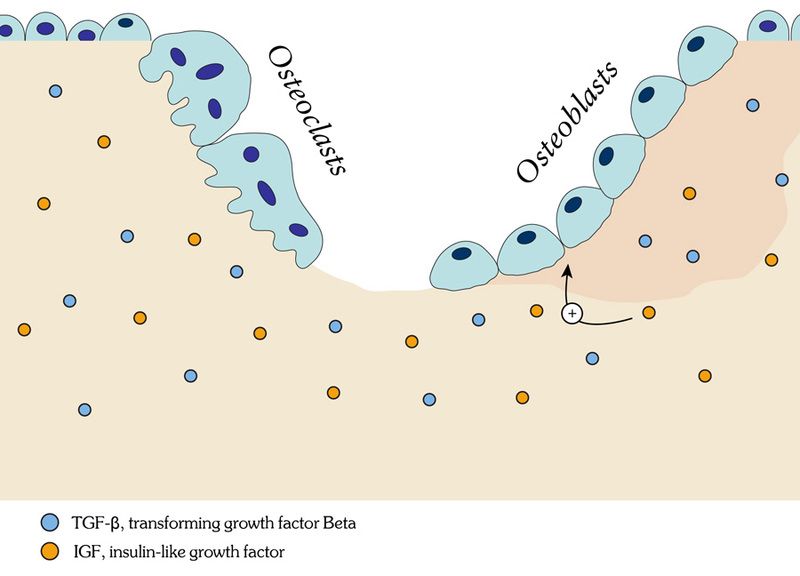 The activity of the bone building cells (osteoblasts) and the bone breakdown cells (osteoclasts) is normally balanced. It is accepted that bones are not as stable on average in old age as they are in middle age. Bone remodelling is crucial for the mass, density and stability of the bones. Bone breakdown is normal after middle age to a certain degree, in line with less physical exercise usual taken with advancing age. In many people, however, muscle performance or muscle fibre activity decreases significantly in old age as a result of restricted mobility or lack of physical exercise. The consequence is that the balance of bone remodelling shifts as far more bone is broken down compared to the amount of bone that builds up, leading to a decrease in bone mineral density. Osteoporosis can develop when bone remodelling becomes imbalanced. When the cells that build up bones (osteoblasts) become less active, the breakdown cells (osteoclasts) continue to carry out their activity. This breaking down of bone takes place slowly over several years: it is imperceptible and therefore usually unnoticed. Unless a BMD measurement (DEXA scan) is taken, someone with osteoporosis won’t know until the disease is more advanced. Women are more susceptible than men to osteoporosis – mainly because of hormonal changes during and after the menopause. Men generally have more stable bones than women but can still be affected by osteoporosis as it’s not just hormonal changes that result in the condition.